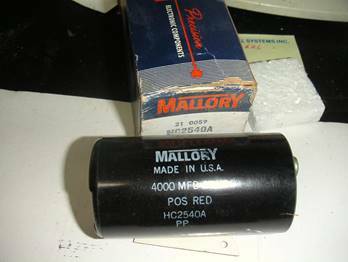 This page has electrical and pneumatic gauges, mechanical gauges, Hydraulic valves and so on. API shielded temperature meter, 0-300F, 0-150C, new, tested. Model 7045, new but box is missing. short length of thermocouple wire attached let me test it. Milton model 1028 oiler - very helpful if you are using air tools a lot, I find this listed at $50 at various web sites. Milton - 1028 - lubricator, 1/4"
It looks like this valve was prepared for assembly but was never actually installed in anything - the threads in the two open ports look like nothing has ever been screwed into them - I've left the nice stainless steel fittings on the valve, perhaps you can use them and save some $$. the spec sheet says: "
• Unique sealing member isolates pilot air pressure from mainline fluid. 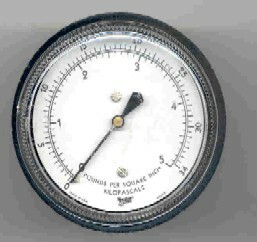 • Variations in pilot air pressure do not affect valve operation. • Design provides long life handling of lubricated air. • Handle fluids up to 200°F (92°C). • Some constructions handle steam up to 353°F (177°C). • Mountable in any position. NEW, in the box, 2 inch diameter gauges made by Marshall. 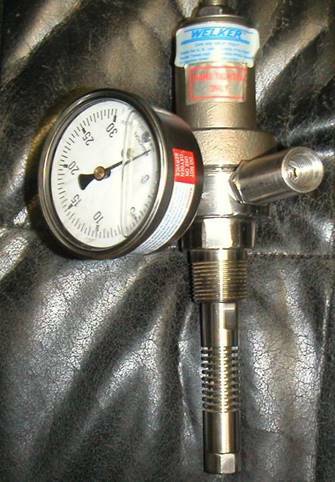 The gauges are calibrated in both PSI and KiloPascals. They include the bracketry and mounting hardware (see picture). The threads on the attachment fitting are 1/8 NPT (brass). 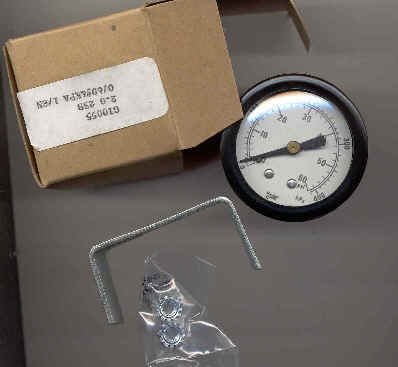 These gauges are suitable for air, nitrogen, argon, etc. They fit into a 2 1/8 inch hole if you wish to panel mount them. 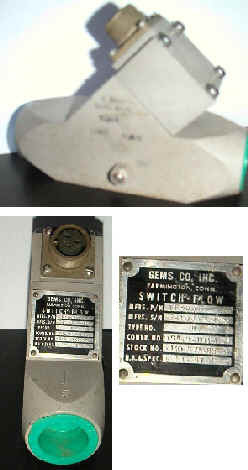 The box is marked "G10055", "2.0 23B" , " 0.60.#&KPA 1/8N". The aluminum label on the valve says "KONAN Glendale CA, USA"
Paper sticker on valve body says "KONAN Factory Mutual System Approved"
This is a large "FULL-View" glass tube variable area flow meter. The glass tube is enclosed in a heavy duty aluminum and glass enclosure allowing the indicating ball to be seen from front and rear. 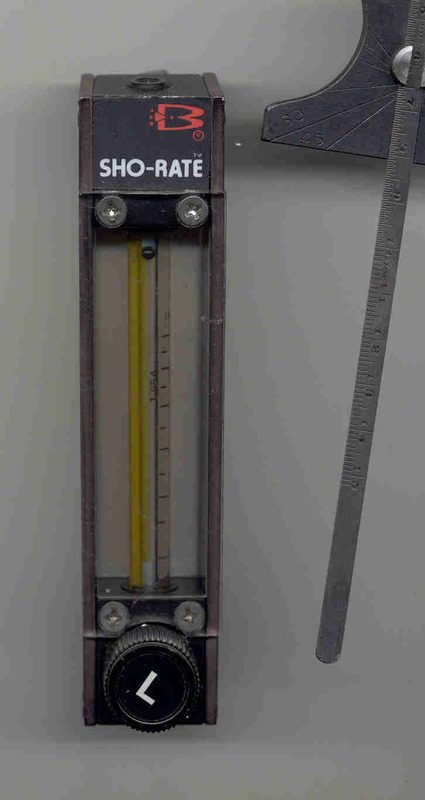 The scale is calibrated in milimeters, range of 0 to 250 mm. designated by the letter H in the model #. Make offer on this item Smaller Brooks "Sho-Rate" flow meter - the rule next to it is 6 inches long. I have several of these, some are new and sealed, some are used. One KiloPascal = 0.145 Pound per Square Inch. 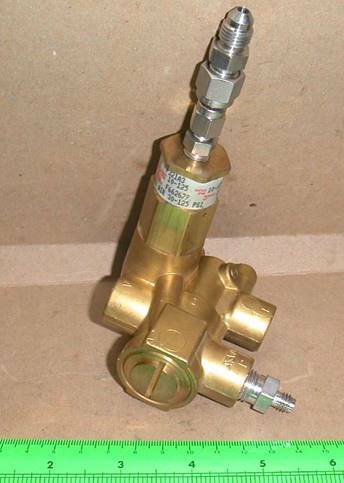 Grove Hydraulic Valve, with very large aluminum handle". Body is steel, 1" thick. 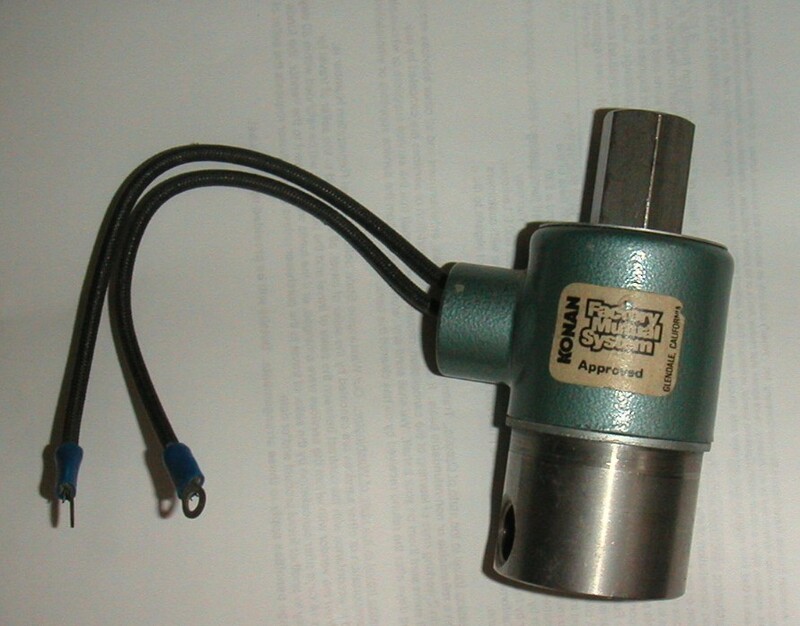 Removed from a hydraulic cylinder test set - presumably aircraft related - very nice valve, 10 turns (maybe 9 - I might have lost count) from stop to stop, designed for precise flow control. I haven't seen this design before - the big handle threads onto the valve body and then presses on the stainless steel stem to control the flow - there is a clip ring to keep you from unscrewing the handle. The valve has one inlet and two outlet ports - I presume it is a 3000 PSI valve, though there are no markings on the valve body. The handle is marked 098001A. 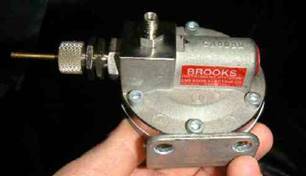 Description Brooks ® NRS flow controllers accurately adjust and maintain small gas and liquid flows. Model 8844 is designed for constant downstream, variable upstream applications and Model 8944 is designed for constant upstream, variable downstream applications. 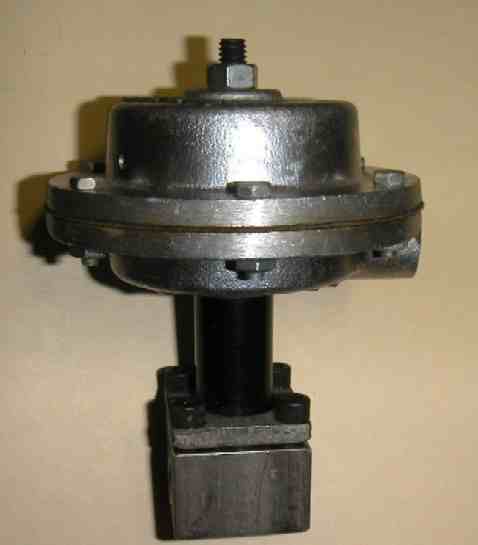 Models 8844 and 8944 are supplied with an integral NRS (non-rising stem) control valve. It features an adjustable sliding tapered needle which resists sticking due to foreign matter in the fluid. Particularly suitable for precise control requirements, this valve possesses a high turns-to- lift ratio which provides stable flow for any given stem position. This item is in very good, possibly near new condition - as you can see from the photo, it is missing the knob - I believe that it was mounted to a panel on an item of equipment that was surplussed before it was placed into use. Welker Probe Regulators provide a regulated sample supply of liquid or gas product from a pipeline to chromatography H2S analyzers, gravitometers, calorimeters and other on-line analyzing equipment. Two models are available-a Standard Probe Regulator that is designed to be installed in the pipeline,and an Automatic Insertion Probe Regulator that is designed to be inserted into (and withdrawn from) a pressurized pipeline (maximum operating pressure 1800psig) without pipeline shutdown. On both models, the inlet is positioned on the end of the probe to enable it to collect product from the central portion of the pipeline-giving you a more representative sample. Both probe regulators inhibit carry-over of free liquids into the instrument supply system. The diaphragm design of the Probe Regulator allows it to respond quickly to sensitive changes in outlet pressure, making it well suited for applications requiring an accurately regulated source (down to 0 psig). The Automatic Insertion Probe Regulator allows the operator to control the movement of the regulator in and out of the pipeline safely-through the use of three control valves on the oil reservior. This is especially advantageous in applications where it is inconvenient to interrupt the flow in the pipeline. Click to enlarge Flow switch that has been sitting in my garage for quite a few years. Since I've never used it nor needed it, it's time for it to find a new home. It looks like it's never been used, although there are a few scratches on the outside from knocking around with other stuff - both ends are sealed with plastic plugs, so there should be no contamination inside. The threads on both sides are, as best I can tell, 1 inch X 13 threads per inch. There is a directional arrow stamped in the body indicating the direction of flow. On the side, it has been stamped "O ring Cure Date: 1Q64 ASSY 1Q65"
So, that makes me think this is a 40 year old valve, probably surplus from the space program, or from aircraft equipment, possibly from the old Douglas Aircraft plant at Clover Field in Santa Monica (I got it decades ago from a retired machinist near the Douglas Plant).